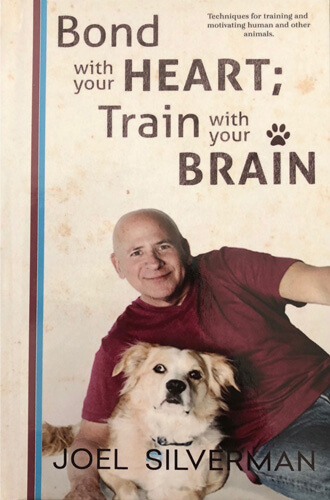 Very few animal trainers have had a chance to work on both sides of the camera, so Joel looks at his life as a true blessing, so he wanted to share this very extensive bio page with you! 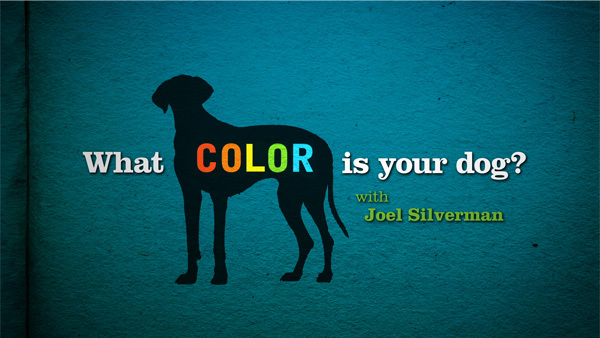 Below, you will see a chronological look at Joel’s very unique career as a show performer, Hollywood dog trainer, TV show host, and teacher. 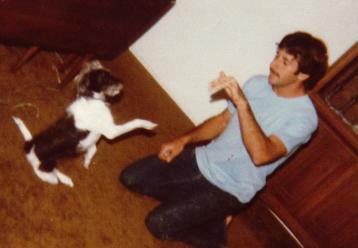 This picture is really where it all started, as you see Joel Silverman in the mid-1970’s training his family’s dog named Shadow. When they first adopted her, she was extremely afraid and nervous, so Joel and his family took the time to develop a great relationship and trust with this dog. 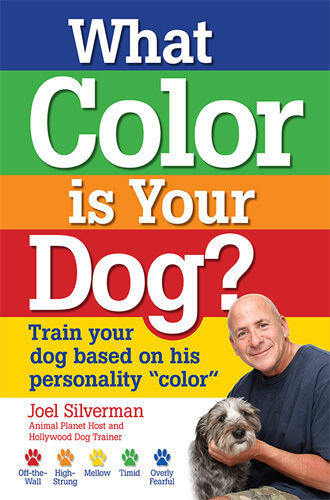 Not only did Shadow become a loving member of the family, but became Joel’s first dog he trained. That relationship and trust is still something Joel talks about in all his books and on TV, and is his secret to his success. In the early 1970’s, Joel’s parents would take he and his family to San Diego every summer for vacations. While there, they would go to Sea World and watch the marine mammal shows. He developed a fascination with marine mammals. He eventually got hired to pick up trash in the summers, and when he graduated from high school, moved down there, and picked up trash full-time. After a few years of being persistent, he was hired as a trainer. 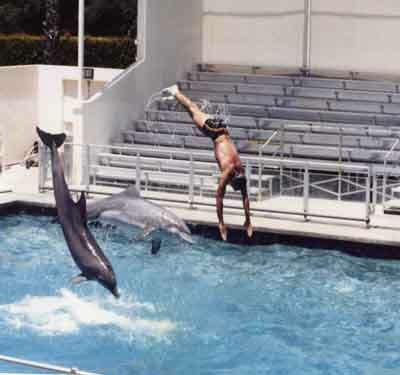 To take a look at more of pictures of Joel training dolphins, check out the dolphin photo galleries. Every intelligent animal has the potential to learn so much more than the average person would think. 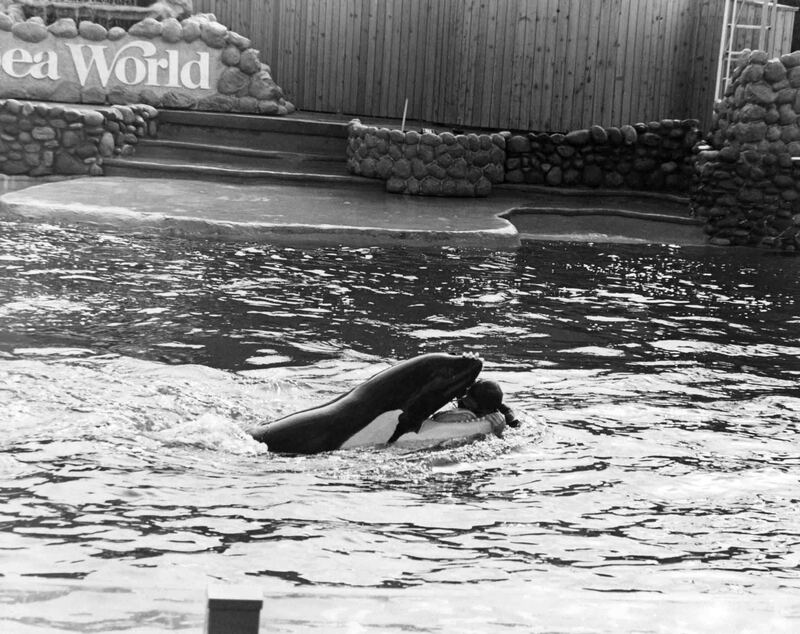 The thing that was great about working with killer whales is their potential and desire in wanting to learn, and the enjoyment the animals got from it. 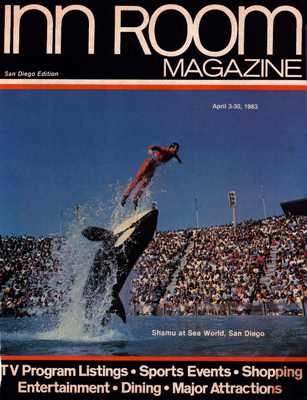 This is Joel on a killer whale performing a behavior called the Rocket Hop that he trained with this whale as well as two other killer whales that landed on the cover of Inn Room Magazine in 1983. This was taken at about 9:30 in the morning when Joel first completed the behavior. Joel would stand on stage and give the whale a cue. The whale would take off and swim to the corner of the pool and do a bow. At that time Joel would dive in and swim down 33 feet to the bottom of the pool. The whale would meet Joel there, slow down, get in a vertical position, and let him stand on her pectoral flippers, and hold on to her nose. She would then excel at a fast rate of speed, breaking the surface shooting Joel off. Although Joel started off training birds. 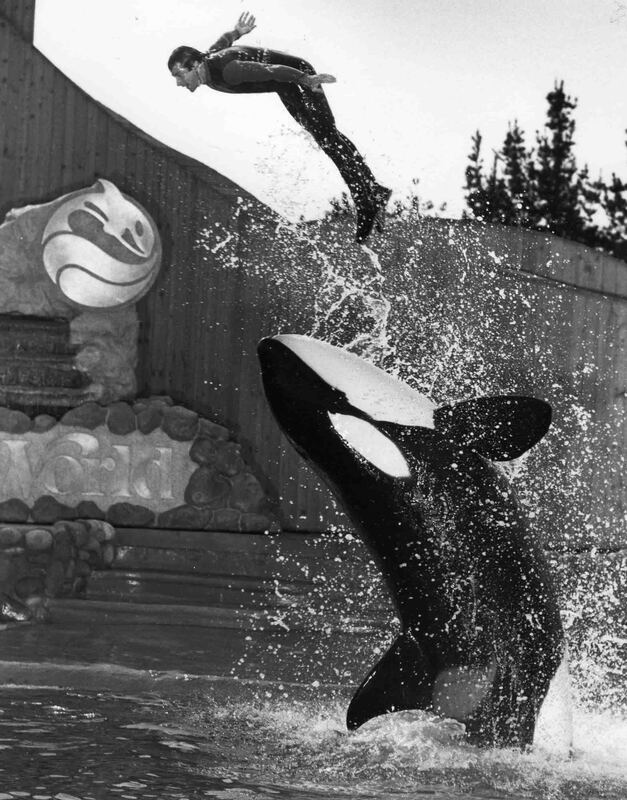 then sea lions, otters, and dolphins, he will tell you that there is no question that his experience training killer whales was one of his greatest memories. 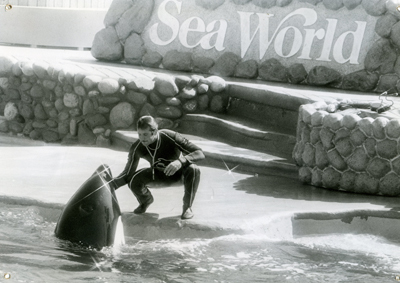 To this day, there are a number of training techniques that Joel uses every day that he attributes to his experience working with killer whales. 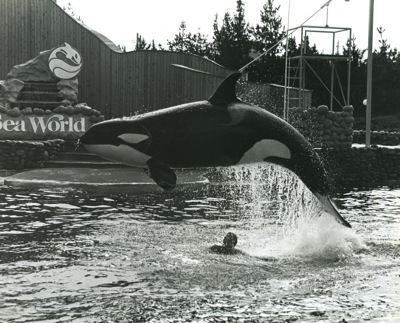 This is Joel on a killer whale performing a behavior called the ride jump that was seen in the 1970’s and 1980’s. 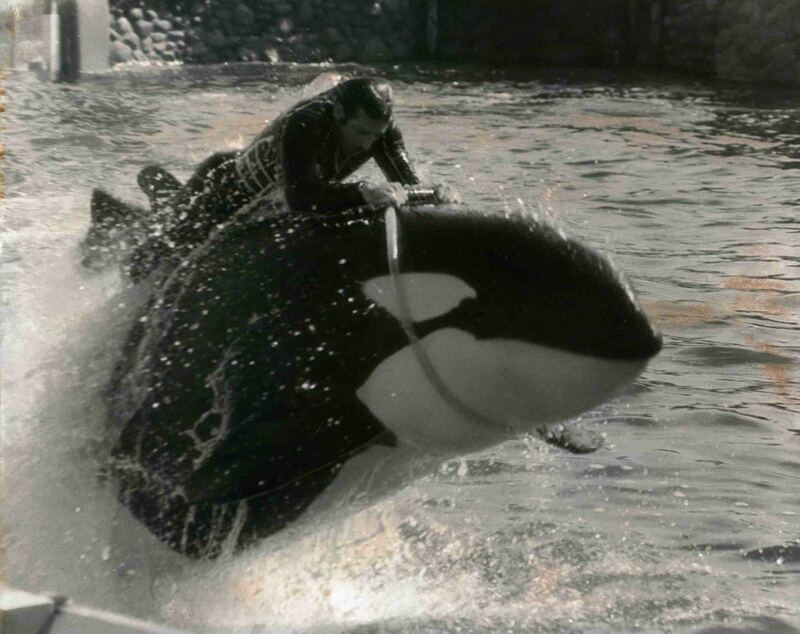 The whale would swim through the soft hoop, and the trainer would get on the whale’s back. She would go to the bottom 33 ft down, and do a series of bows with the trainer on her back. As Joel will tell you, the trust is everything in working with all animals. Having that bond is what propels the best of trainers, and that bond and trust is no different in working with killer whales and dogs. 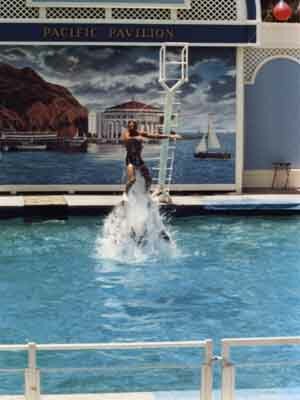 From 1985-1987, Joel worked for a company that contracted marine mammal shows to a number of the Six Flags theme parks. 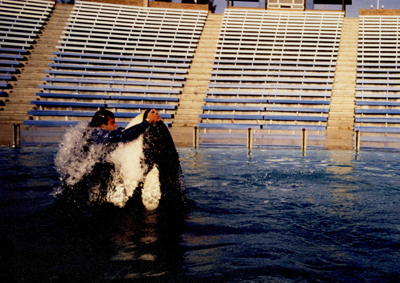 He spent a summer doing the dolphin and sea lion show at Magic Mountain in Valencia, California, and then got the opportunity to put a new show in at Knott’s Berry Farm in Buena Park, California. 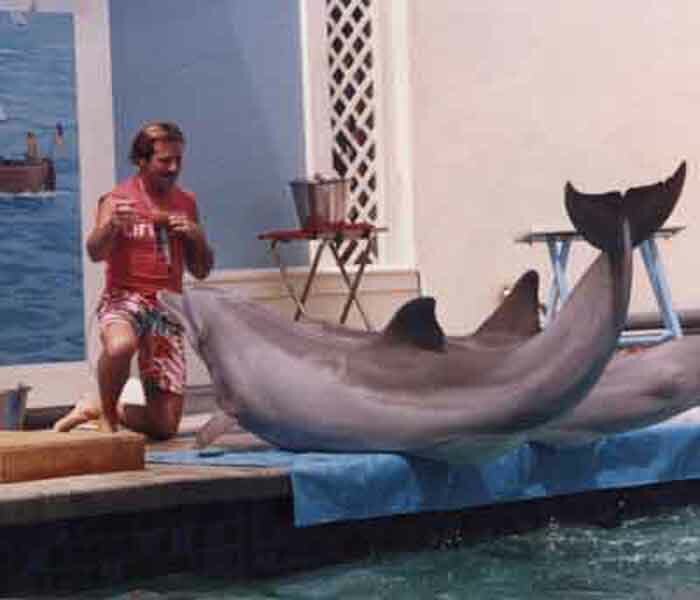 Joel trained this behavior on two dolphins named Happy and Soda. They would push Joel with their noses (rostrums) around the pool, and each one would have a nose on the bottom of Joel’s foot. Joel would take a breath of air and the dolphins would push him to the bottom. He would arc back and then arch his back so that he was vertical. The dolphins would then thrust him upward at a fast rate of speed out of the water. This was presented at the I.M.A.T.A. Conference in 1986, and Joel won the Behavior of the Year Award. 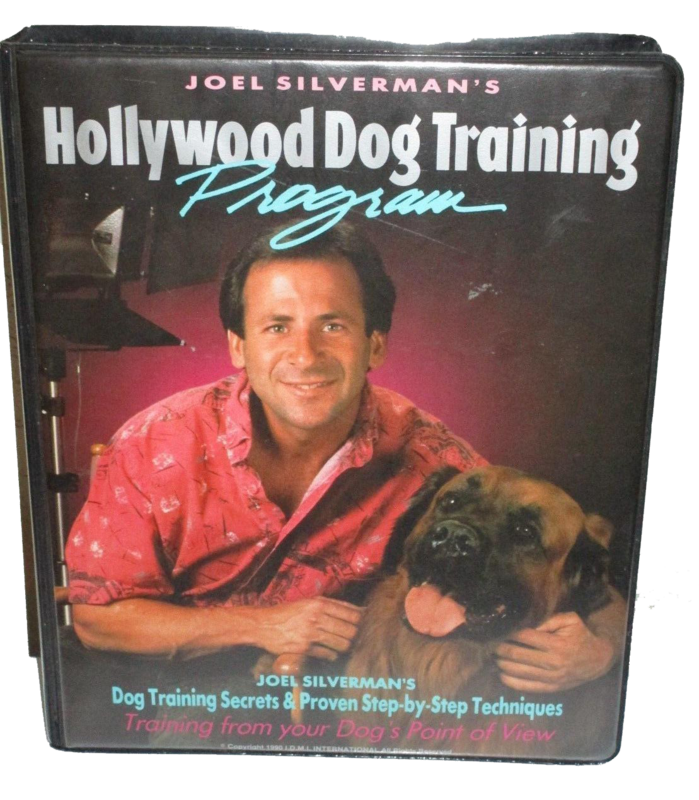 From 1988-1992, Joel had the opportunity to train a dog on a top-ten TV series called Empty Nest. 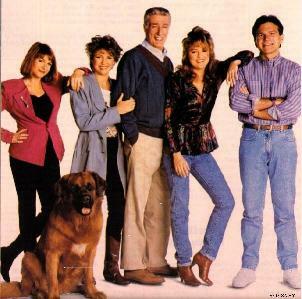 Empty Nest was a spin-off of the already successful TV series Golden Girls. 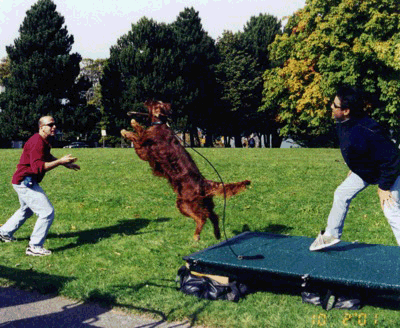 Joel trained the dog named Bear who played the character of Dreyfuss on the show. 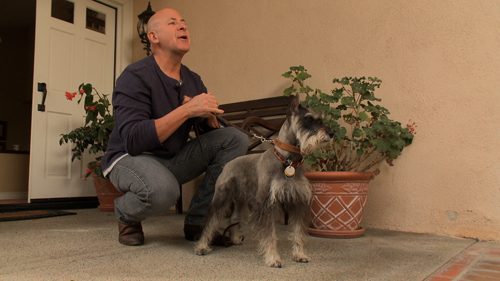 He did use a few other dogs named Julio and Banjo in a few scenes, but Bear did 99% of the work. Joel will tell you that this four year period was one of the best periods of his life. He attributes it to an amazing cast and crew, and of course, Bear. 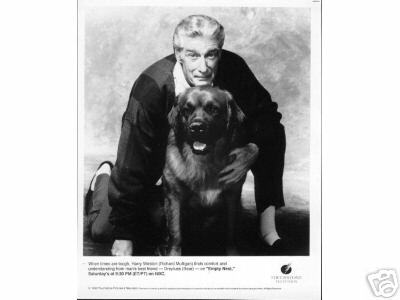 Joel just wanted to let everyone know a little something special about Richard Mulligan. He was certainly the star of the show, and was not a stranger to winning Emmy Awards, as he won an Emmy Award for playing the character of Bert on the TV series Soap. Richard was a very quiet man, but was extremely kind. Joel talks about every day he would come to work with Bear, Richard would almost always make it a point to say hello to the dog. Another great example of this was when he one an Emmy Award for Empty Nest, and thanked the entire cast, including Bear and Joel. 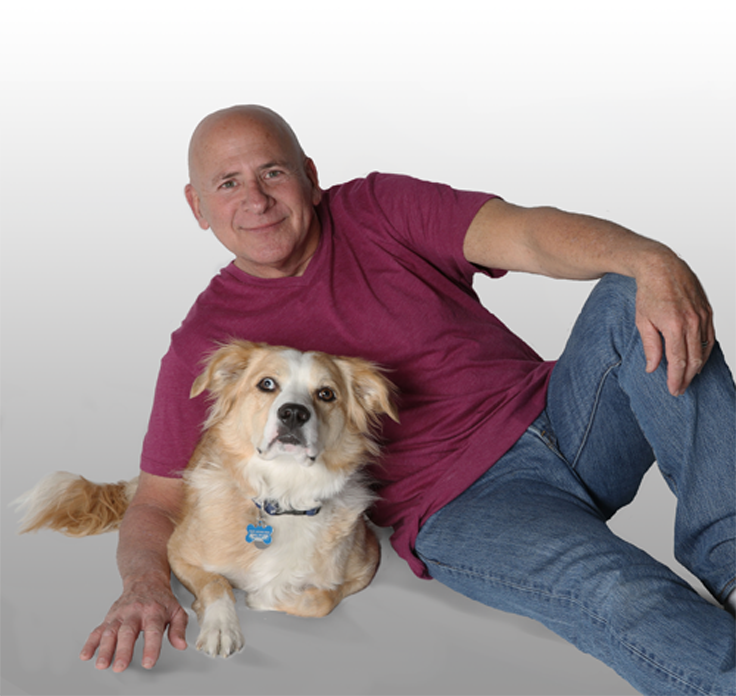 We included this video here because it was a video Joel did when he was working on Empty Nest. 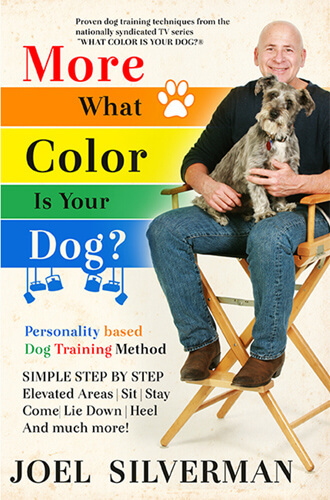 This was actually his first of many dog training videos, but sold over 300,000 units. It was a great opportunity to do the video, but more importantly, to have Bear co-host it with him.